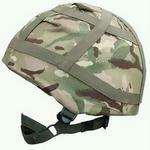 These latest pattern helmet covers are used to camouflage the helmet and assist in the attachment of camouflage. The fabric is a 67/33 Poly-Cotton blend in Multi Terrain Pattern (MTP). Manufactured for the British GS Mk.7 ballistic helmet, it will also fit the British Mk.6 and Mk.6a helmets as well as other similarly sized "battle bowlers". These are all unissued and still wrapped in manufacturers packs.